Lacto-fermentation is something I’m relatively new to, but I’ve gotten a bit of practice over the last few months. I’ve successfully made sauerkraut, ketchup, mayonnaise, kimchi and some pickles. We weren’t huge fans of the pickles (except for Tonchi who loves them). The rest of us weren’t too thrilled with the flavor. I think that was due to the fact we were expecting the flavor to be similar to traditional pickles, of which it wasn’t. I also plan to try it a few more times with different ingredients. The fermented ketchup has a distinct tomato flavor, much different than the traditional version of tomato flavored corn syrup. I’m hoping to add mustard to the repertoire before too long. I know mustard can help with asthmatics and regular cough and congestion because it helps to open the airways. I’m hoping to do that in the next week or two and post it as well. Now that winter is coming on and Tonchi usually gets a pretty rough upper respiratory infection (URI) I’m hoping this might help… especially since he likes mustard! We have been making our own mayonnaise for the last year or two and it usually turns out pretty good. I’ve found that the fermented version has been molding on top if not used pretty quickly. I think that may be due to the fact that I was storing it in a crock that I don’t think was air tight, so I’m going to have to try it again. I’ve also used olive oil, coconut oil and sesame oil to make it and every version is a little different. Right now I think the olive oil version is our favorite since it is most like traditional mayo! The pickles, like I said didn’t turn out great, so I’m not really ready to post on that. I’d like to find/make something we really like before sharing it. I don’t share recipes that only turn out mediocre or just ok. I want to make sure I’m sharing the best of my best! I did a post last spring on Lacto-fermentation which actually includes most of the information that [amazon_link id=”0967089735″ target=”_blank” container=”” container_class=”” ]Nourishing Traditions [/amazon_link] talks about. Feel free to refer back to that post for more detailed information about it. This chapter in the book includes lots of recipes for different types and flavors of sauerkraut, chutneys and pickles. A lot of them look amazing and I can’t wait to give more of them a try! The pickled ginger and pickled garlic look incredible! I’d also like to try the fermented ginger carrots which I’m sure would be a good side for a meat dish! I’m not usually a huge fan of fruit chutney’s but I should probably try them again. This chapter has a lot of them, so at least I know where to find a few! 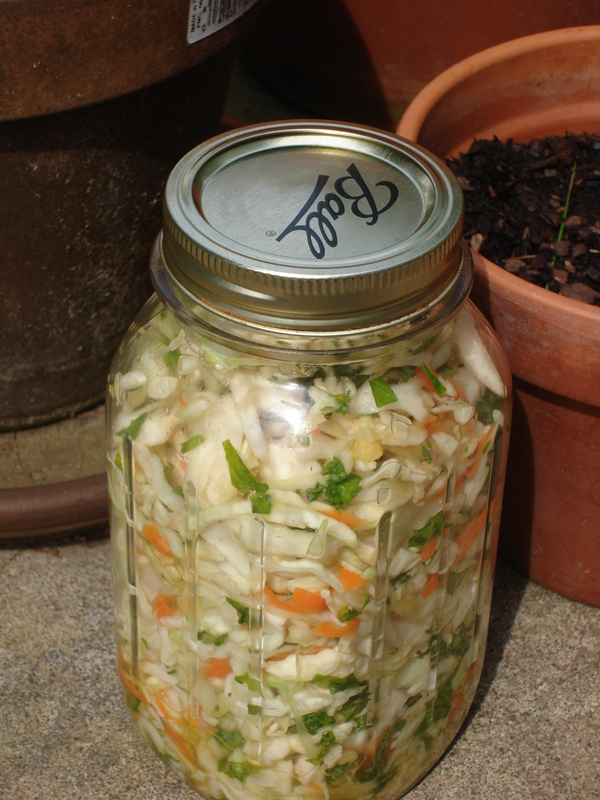 Our most successful ferment was sauerkraut! It was SO delish and so easy to do. The basics are wash, cut, add ingredients, pound and wait! I’ve included below the recipe that I used from [amazon_link id=”0967089735″ target=”_blank” container=”” container_class=”” ]Nourishing Traditions[/amazon_link] on page 92. When I made Kimchi I used pretty much the same concept, but just added some garlic, ginger, carrots, onions and some chili flakes. It wasn’t red like most kimchi is, just because we didn’t add the large amount of peppers to it, but it was still super good! In a bowl, mix the cabbage with caraway seeds, sea salt and whey. Pound with a wooden pounder or a meat hammer for about 10 minutes to release juices. Place in a quart-sized, wide-mouth mason jar and press down firmly with a pounder or meat hammer until juices come to the top of the cabbage. The top of the cabbage should be at least 1 inch below the top of the jar. Cover tightly, keep at room temperature for about 3 days before transferring to cold storage. The sauerkraut may be eaten immediately, but it improves with age. I found that 1 head of cabbage made about 2 ½ quarts instead of a quart as the recipe states. I also added a lot more caraway seeds because I like the flavor they add! I also let it ferment about 1 week… much longer than the recipe states. I think it should be about 72 degrees for it to ferment at a good rate. If it is cooler it will probably take more than 1 week. It also takes about 6 months for the flavors to meld. After the original week of fermentation I store in the back of the fridge for 6 months. And Mmmm it is so yummy when it’s done!